How To Reduce Your Blog's Bounce Rate? This post basically explains the following questions: What are Analytics?? 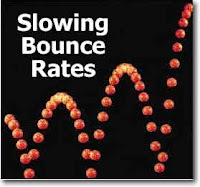 What is a bounce rate?? How vital is it to your blog?? How to reduce the bounce rate of your blog?? Once you build a website or a blog, your primary aim is to increase the traffic to your site/blog, in other words, you try to attract as many people as possible. This could be achieved by the adding your posts to various social bookmarking sites, networking sites, participating in forums and so on. Do you think, it is enough if we just increase the traffic to our blog??? Definitely not!!! You need to analyze the traffic or statistics(analytics) of your blog. So, What are Analytics? To keep it very simple, it is a tool to measure your site's performance. It displays various data regarding your blog and bounce rate is one such data. Most of the newbies install Google Analytics on their blogs but they do not know, how to interpret these data. I restrict myself to explain only about "Bounce Rate" in this post. So, What is a Bounce Rate? Wikipedia defines it as, "Bounce rate is a term used in web site traffic analysis. It essentially represents the percentage of initial visitors to a site who “bounce” away to a different site, rather than continue on to other pages within the same site." I feel the statement is pretty self-explanatory. To keep it very simple, bounce rate simply represents those percentage of visitors who move away to some other site after visiting a page on your website. You may find the percentage for "Bounce Rate" on the right corner below the graph once you log in to your Google Analytics Account. Higher the bounce rate, more the number of people leave your blog after a single web page visit. As per the definition, an ideal percentage of bounce rate would be zero. Practically speaking, a bounce rate below 60% is good for any blog. So, our only task is to make him/her stay in our blog or in other words, just get the second click out of the visitor. Though, it appears to be very easy, it is one such area that even probloggers constantly work upon.. I am pretty sure few ideas would have cropped if you clearly understood the post till this. You may implement your ideas but, do consider the following methods in reducing the bounce rate. 1. Clean Template: The first impression is always the best impression and you can gain that best impression only when your blog looks clean and tidy. It is not necessary that it should look very professional but, it should be clean. I mean the widgets should be placed properly, broken links should be updated and so on. 2. Quality Content And Keywords: Content is always the king!! So, it is very important that your blog provides quality content. Please, ensure that the keywords are relevant to the content of your blog. It is important that both the keywords and content go hand in hand or else you end up providing the wrong information to the search engines. By doing this, you lose the second click from the visitor. 3. Internal Links: This serves to be the most effective way of reducing a blog's bounce rate. When you provide links which are relevant to the content, within your blog, it is obvious that the user makes a click on it and thereby, he keeps hopping around your blog. In fact, you end up boosting your page views and back links too. 4. Related Posts: The last factor which I would suggest to reduce the bounce rate would be the related posts widget. I recommended every blogger to add this widget which is given by Blogger at the end of every post. It will have a tremendous effect in reducing your bounce rate and increase the page views of your site. or try using Linkwithin.com which now i am using for my blog. As far as I know, the above four methods will definitely reduce the bounce rate. To be very frank, even I am currently working on reducing the same for my site. I So, I appreciate any ideas from your side as well. Leave them as comments below this post and I assure you that I will include them in my next series of post.